Another representation of Nara Singha. bl.uk > Online Gallery Home	> Online exhibitions	> Asia, Pacific and Africa Collections	> Another representation of Nara Singha. An albumen print by Richard Banner Oakeley of a sculpture at Halebid in Karnataka. 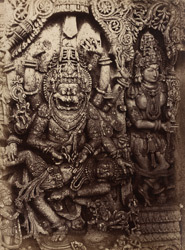 The carving, of chloritic schist, represents Vishnu in his incarnation as Narasingha (man-lion), in which form he destroyed the demon Hiranyakashippu. The Hoysala dynasty who made Halebid their capital, built many temples, some of which such as the Hoysaleswara temple are considered tremendous achievements of Hindu architecture. The temple's walls are covered with sculpture panels of various divinities, both Shaiva and Vaishnava.